Understanding and engaging kids can be a challenge. So who better to look to for ways to motivate youth than someone who started a global organization as a “kid” herself? “When I was 19 years old, I co-founded TakingITGlobal (TIG) — an international charitable organization that empowers youth around the world to understand and act on the world’s greatest challenges,” says Jennifer Corriero. “TIG serves youth worldwide through a multilingual online learning community and innovative education programs geared towards active global citizenship.” Corriero, along with co-founder Michael Furdyk, works daily to motivate and engage youth by leveraging the power of social technology. Corriero’s work has garnered her worldwide recognition, as well as many awards. Some recent commendations include the 2008 Women of the Year (The Women’s Post), Impact Social Entrepreneur of the Year Award (2008) and Canada’s Most Powerful Women (2007), to name just a few. “TIG’s award-winning ‘social network for social good’ offers youth a diverse set of educational resources and action tools intended to inspire, inform and involve them in shaping a better world,” says Corriero. “Since its launch in 2000, TIG has been accessed by more than 20 million individuals in order to learn, connect, and work together to affect change in their local and global communities. Our vision is a world in which youth everywhere are actively engaged and connected in shaping a more inclusive, peaceful, and sustainable world.” Some of these resources include an online community for young leaders, and a platform for classrooms and instructors. Corriero gives us her insight on how to engage kids today, and why letting them make decisions makes all the difference. What have you seen change as a result of the launch of TIG? Since TIG’s launch in 2000, we have been pioneering efforts to augment young people’s voices through the power of social technology. We are contributing to the rise of global youth collaboration networks and youth-led action projects through our online community and programming. The TIG site provides an avenue for the world’s youth to learn about pressing global challenges, share and discuss ideas, and work together to affect positive change. We also run e-courses for young social entrepreneurs to give them the project management training they need to imagine, plan, and implement their initiatives for change, and a fellowship program to provide further support through seed funding. Members report that participation in the TIG community has contributed to their awareness of global issues, world geography, and other cultures; exposure to professional and academic opportunities, events, and resources; information, media, and technology skill development; capacity to connect, communicate, and collaborate with peers; and volunteer activity and other community engagement. We are also a major actor in the push to give young people a stronger voice and influence in the decisions that affect them. We work to facilitate youth involvement in global policy processes, and our special consultative status with the UN Economic and Social Council provides a gateway for a formal voice for youth on the global stage. Our work in these areas is regularly referred to as a case study and proof point that helps to justify further investments in young people. How can other educators facing similar challenges implement what you’ve learned through this project? Educators have a critical role to play in inspiring, encouraging, and guiding youth to become lifelong learners and leaders. They can contribute to their students’ active global citizenship by introducing them to TIG’s social network for social good, and the tools, resources, and connections available there. Better yet, they can get their classes and schools involved in TakingITGlobal for Educators (TIGed), which offers free programs, resources, and online tools to engage students in collaborative education. Since 2006, the TIGed community has grown to include over 3,000 schools in over 130 countries. We offer programs that leverage — and thus rely on — technology. One of our biggest challenges in ensuring access to our tools, resources, and programs is the lack of computer equipment and Internet access. This is true within industrialized countries such as Canada, as well as between countries around the world. One of the ways we are working to overcome this challenge is by making more of our online tools and spaces available through mobile applications — which are being increasingly adopted as a means for accessing the Internet, especially in less developed countries. Countries around the world need to increase funding to education in order to help address the digital divide. What is going right with education? My travels have connected me to some of the world’s most passionate educators and innovative educational practices and projects. It is amazing what some educators are able to accomplish in the face of harsh conditions and limited resources. It is also amazing what can happen when good teachers are equipped with the technology they need to access information, connect with experts, collaborate with others, and so on. I am convinced that global, networked learning is one of the keys to building a better world. We need to be able to understand, respect, and work with our global peers if we are to overcome the challenges we collectively face. In this sense, I am particularly encouraged by the commitment to education demonstrated by countries such as Australia, New Zealand, and Singapore, which are ensuring that they invest in technology and supporting professional development. After all, it is not the technology that matters, but how it is employed. I think that all stakeholders in the education system — students, parents, teachers, and administrators — would benefit from increased efforts to include students in decision-making processes that affect them. Learning becomes more personalized and powerful when students co-design their learning experiences. And opportunities to express needs, issues, and ideas do not only contribute to students’ personal character development, but also they also provide critical input into how to make education more relevant, effective, and fair. We already have the ability to connect classrooms internationally so that they can learn and work together. In an increasingly globalized and interdependent world, I think we need to see more collaborative learning projects that bring students in a number of countries together to develop solutions for problems they care about. This kind of real-world learning makes education more relevant and gives students a stronger voice in their learning. It also helps to drive creative thinking, communication skills, and new ideas and innovations. When we recognize that the future rests in the hands of today’s children, as most teachers do, it is easy to feel overwhelmed at times. I’ve met many passionate and innovative teachers who have gotten burnt out or discouraged from the lack of systemic support and resources for their initiative and creativity. My advice to new teachers is to nurture experiences that allow you to continually grow and learn together with your students. When you feel discouraged, try to connect with inspiring and uplifting individuals, read stories of innovators and doodle your ideas and dreams on paper. While there are challenges and obstacles, teachers can make a major difference in the world through their ideas, inspirations, and daily actions and commitments that build momentum over time. The future of our world depends on the opportunities that we are able to provide to our students. Education is a challenging but rewarding and important profession. The world needs inspired educators. I would say digital storytelling tools, to help children and youth create, showcase, and archive expressions of timeless moments or world-changing ideas. 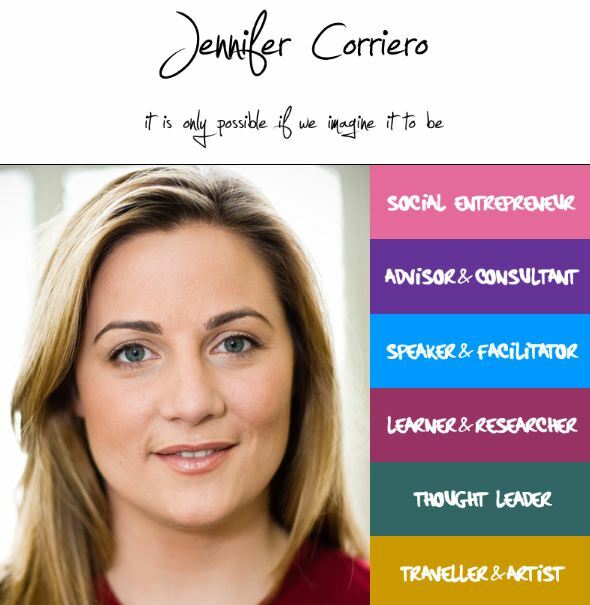 Jennifer Corriero is co-founder and Executive Director of TakingITGlobal, a non-profit organization with the aim of fostering cross-cultural dialogue, strengthening the capacity of youth as leaders and increasing awareness and involvement in global issues through the use of technology. In 2003, Jennifer was a member of the Official Canadian Government Delegation to the World Summit on the Information Society. In 2005, Jennifer was named a Young Global Leader by the World Economic Forum and in 2007, as one of Canada’s Top 100 Most Powerful Women by the Women’s Executive Network and as a York University Bryden Alumni Award winner. In 2007, TakingITGlobal was recognized by the Tech Museum Awards as the Education award winner. Corriero has presented and supported civil society engagement at events including the World Urban Forum, International AIDS Conference, World Summit on Sustainable Development, Youth Employment Summit and Global Knowledge Partnership International Forum. Education: Masters in Environmental Studies with area of concentration on Youth Engagement and Capacity Building across Cultures. Adjunct Professor Appointment by the Faculty of Health at York University. Person who inspires me most: People who follow their dreams and transform them into reality inspire me most. Favorite childhood memory: After-school or summer programs playing sports and making crafts. Next travel destination (work or pleasure): Over the past decade, I’ve travelled to over 30 countries, and I look forward to further global connections. My upcoming travel plans involve time with family over the summer at a cottage on the lake with our baby on the way! Most recently, I gave a lecture at Penn State University as part of Women’s History Month. Favorite music: Music that moves me or makes me smile (across genres and ages). Recently, I’ve really enjoyed listening (and sometimes singing along) to the song Good Life by One Republic. I also love certain classic songs like ‘Don’t Worry be Happy’ by Bobby McFerrin. This entry was posted in 21st century skills, Beyond the Classroom, Entrepreneurship, Leadership and Strategic Innovation, Social media, Virtual Learning Environments and tagged Education, Entrepreneurship, Technology. Bookmark the permalink.